I think, therefore I code. Did not sleep well. Back at work trying to do stuff. But it was all worth it! My game, Zilla the Destroyer, progressed well and I am satisfied with what I did. I decided to write it in Java because I wanted to train me a bit in it. You can try it out here. You think you can take me down, huh? Come on you dirty apes! Your opposable thumbs are NO MATCH for my might firebally breath! First enemy is in. Now on to tanks and player death. Zilla the Destroyer is taking a well earned bath after some lazy sunday city destroying. Need to add some enemies now so there is something to avoid while burning the city to the ground. I’m thinking tanks and helicopters. The tanks will only have a small damage as it could be difficult to spot them among the buildings, but the helicopters will fire missiles that needs to be avoided or hit by a fireball. Day 2 and I started this fine day with some colour and ruins. The lizard can now shoot fireballs from her mouth and they can hit and destroy building, and it will start a fire for a few seconds. NExt up is to add some explosions when this happens. Got to have lots of explosions! Hardly a game if you dont! It looks a bit better in game. Now to loot the company fridge for food stuffs to put in my mouth. One too many beers last night makes this little coder a bit tired. Lucky for this little coder there is plenty of Mountain Dew and coffee in this building to keep him up for ages! Progress have been good! I decided to go with Java and LWJGL and so far there have been no large problems with it. In just a couple of hours I got a window and a OBJ loader up and running so I can make 3D models in Blender. The OBJ format is surprisingly easy to load and parse. The game is so far just a vague idea in the back of my head. The player will control “Zilla” and destroy a tiny city. It will all be wireframe to have a 80’s retro look. Next up is to create a city out of these 3D models with roads and parks and stuff. Need things to smash and burn! I have had some difficulties during the day but things are progressing well right now. The player can enter and leave room, the camera follows along, doors are closed and then opened again because there’s no enemies around. …Because it makes no sense whatsoever! Now: dinner. And a screenshot. I have been at it for 2 hours now. Right now I’m working on the assets. 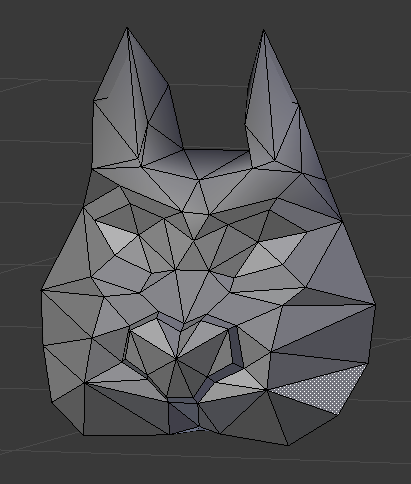 I have created a large kitty face. I will now start working on walls and stuff. My entry will be an arena shooter and the player will run around in a maze looking for keys and whatnot. I’m creating the 3D models in blender, Gimp is used for textures. Unity 3D will them display it all in no less than 3 dimensions of polygons and colors! I will enter Lududm Dare 22 and I will use Unity, Blender and Gimp. Player now takes damage. Will add a huge explosion when the player dies, because we all know that wagons explode violently when they die. It’s just the law of the jungle or something. Now that the place is up and running I can announce that I’m entering this compo. I started my entry when it was about 18-19 hours left and progress have been nice. Player can move the wagon left and right, and also jump. The object of the game so far is to avoid the spears thrown by the native americans. Time to ead food stuff! It’s mainly leftovers from yesterday, and a couple of sandwiches. Progress is relatively good. Refactored the throwing code so it’s now a bit more generic. And now I also have boxes! I will change it so zombies can throw stuff as well, in an atempt to increase difficulty. I’m still streaming at livestream.com/depstv is anyone wants to take a look. It can be a bit laggy because I’m doing 101 things on this little macbook. It holds up amusingly well. Breakfast with a black beauty. She’s eyening my bacon, but it’s all mine! a bit less than 19 hours left now. I had an awesome progress last night and I hope I can keep it up today. But there’s quite a few bits and pieces that I need to do. For example, I need to change the graphics! It’s awful! It has a bit low priority, but still. And I need to add a third enemy. And I need to add the boss fight at the end. And I need sounds! And I need music(?) and I need to add something more to the game. At the moment you walk up to the first zombie, punch him silly, pick him up, hurl at second zombie, repeat until highscore is beaten. One of the last things I did last night was to change it so the zombies wakes up if they’re still on the ground or being carried, but it wasn’t enough to make the game more challenging. I will spend some time to try and do what GBGames are doing with that cork board. I need to plan. Once I have a plan I will try and be awesome! I ate it, and it was good! Now to add health to the player. And then player death. And after that a simple main menu so I can restart easily if I accidently die.